If you are working in the customer service industry, it is safe to say that you will be dealing with angry customers 80% of the time – in this age of digital technology, only few people would call to inquire about a product or service when the answer can easily be found online. It would also be unlikely that a customer will call in for a positive feedback as he would likely be using social media or sending an e-mail for that. Chances are, you will encounter irate customers most of the time. The thing about anger is that it can be dissipated when you use empathy, apologise and use what you have learned about customer service. While you can’t control problems or complaints due to bad service or malfunctioning products, you can control what you say to customers who are already upset. Here are five things that you should never say to an angry customer if you don’t want an already terse conversation go from bad to worse. When a customer calls in to complain, the last thing he wants to hear are your standard procedures. Customers want to feel special and you need to sound considerate of his situation. Instead explain why the policy is there. It is best that you refrain from using the term “policy” but use “guidelines” instead. Customers would feel that these guidelines are not laws set in stone but are flexible for consideration. We all know signing up for a service or availing of a product with warranty comes with a contract or a service agreement. And while it might be referenced on what the customer signed on, the reality is nobody ever reads contracts! Customer service agents need to be trained to emphasize key points in service agreements when doing an upsell with a customer. This way it will prevent irate customers calling in that they didn’t know what they signed up for – which is technically, their fault but in our industry, the customer is always right! Customers don’t want to hear what you can’t do. 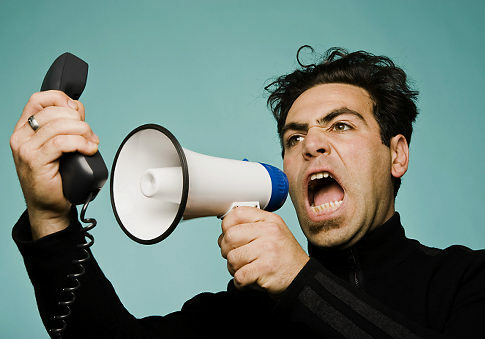 Remember that in diffusing a customer’s anger and frustration, you need to choose your words carefully. Instead of saying, “We can’t” and focusing on what you can’t provide, choose to say, “Sorry to hear that, here’s what I can do for you.” When you take ownership of the problem, you are giving your customer a sign that all will be taken cared of – even if on your side, it isn’t, not entirely of course. An example of this would be refund requests. You can’t outright approve a refund right away but instead of saying, “I can’t approve your refund right now”, try saying “Sorry to hear that we didn’t meet your expectations, here’s what I can do – I will forward your refund request to my supervisor and you can expect to hear from us in three business days. Would it be alright if someone calls you for further feedback and evaluation from the product/service you signed up for?” By taking ownership and setting the right expectation, you are letting the customer know that you are handling his issue and taking care of it. This is especially true with service providers. When customers sign up for your service, they expect that downtimes won’t occur, after all problems or malfunctions in service aren’t their problems – they’re your company’s problems. Your customers don’t care, nor should they. The brutal truth is – they expect to get what they paid for. Don’t make excuses. Apologise but more importantly, fix it – immediately. If you can’t fix it, own up to it. Don’t wait for customers to ask for compensation or refunds. Give it to them right away. It is natural to let a customer vent out his anger or frustration. Remember, it’s not directly YOU who they are angry at but the whole situation. But to answer a long rant with silence is far worse than replying with any of the statements we listed above. It is a gross disrespect to the customer, similar to hurling bad words. It means that you don’t care – and in customer service, you should! In 2013, 72% of customers expect a response within the hour on Twitter from your brand after they complain. And it doesn’t really matter if it’s during business hours or not. Actively listen. Don’t interrupt but control the conversation. This statement may sound contradicting but best practices will train you how to handle angry callers – you will learn how to handle it effectively without the need to escalate the issue to a supervisor. Remember, even the worst complaints can be handled. People are just upset and need to be heard. By employing active listening skills, ownership, assistance and most importantly, apologising and choosing the right words during your conversation, every angry customer would eventually be appeased. I enjoyed this article. I refer to these five things a “loyalty killers.” They do nothing to re-establish confidence with the customer in a tenuous situation.